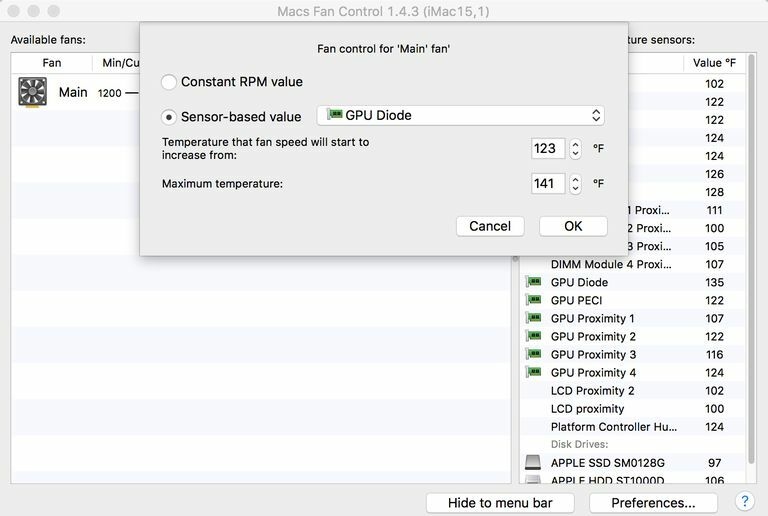 Macs Fan Control from CrystalIdea is a utility app that allows you to monitor your Mac's temperature and fan speed. If the app stopped there, that would be enough to make it a useful tool for many Mac enthusiasts. But its developer, CrystalIdea Software, took it several steps further, to provide not only monitoring capabilities but also the ability to control fan speed, both directly, by setting the desired RPM, and programmatically, by setting desired speeds based on measured temperature. You can select the temperature sensor to use when you decide to take control of a fan. You can set a static fan speed, or have the app use a sensor to control fan RPM. App doesn't indicate which sensors are associated with which fans. This makes it possible to select a sensor to control a fan that has nothing to do with that specific fan. Lacks an automated notification system. Macs Fan Control provides something that only Apple possessed in the past: the ability to control how a Mac's cooling fans perform. This is actually a big deal, and something that shouldn't be taken lightly. Incorrect use of this app (or similar apps) could potentially cause damage to your Mac. Apple used advanced thermal modeling to come up with the cooling profiles used in a Mac's fan management system; Macs Fan Control can replace the Apple-supplied fan profile with one you create, and is geared more toward intermediate to advanced Mac users than beginners. That doesn't mean that if you're a beginner you shouldn't use it, only that you should use it carefully and wisely. You've replaced a component in your Mac (drives or graphics cards come to mind), and in the process, the old temperature sensors were damaged or are no longer measuring temperature correctly. You can use Macs Fan Control to set a fan speed limit to prevent a fan from revving up beyond what is needed. Your Mac is being used in a particularly noise-sensitive environment (such as a recording studio), and while you can normally use the default fan control, there are a few short periods of time where you need to silence your Mac as much as possible by preventing the fans from spinning up beyond a preset limit. You don't actually have to use the fan speed control feature of Macs Fan Control to appreciate this utility; you can simply use the app to monitor the various temperature sensors within your Mac, as well as the speed in RPM (Revolutions Per Minute) of the associated fan. That's how I primarily use Macs Fan Control: to monitor the internal temperature of the Mac I use, and to note the fan speed. Many times while using my Mac, I'll notice the fans picking up speed, increasing the RPM to cool down the Mac. For me, this seems to happen with specific websites, which I assume are using an unusual amount of Flash, video, audio, or other "special" content on their website in the belief that an ultra-dynamic interactive website is a better experience than their competitor's site. I usually just note the website URL and think twice about returning. Macs Fan Control is also a good indicator of the resources being used by just about any app you're running on your Mac. Playing one currently popular game on my iMac tends to raise the GPU temperature quite a bit. If this were a game I was going to play often, I would likely set Macs Fan Control to increase the fan speed a bit sooner, when the GPU diode sensor started showing an elevated temperature. No matter how you plan to use this nifty app, you'll find the controls and layout easy to use and navigate. The main window uses two panes; the first shows the fans in your Mac and their speed. There is also a control section that you can use to create custom settings for each fan. The second pane shows the temperature of each thermal sensor in your Mac. This uncluttered and simple interface displays all the pertinent information you need at a glance. Constant RPM: You set the RPM manually, and the fan will spin at the desired speed regardless of temperature or sensor values. Sensor-based value: You select the sensor to use and then define the low-end temperature where the fan speed will start to increase, and the high-end temperature where the fan will be set to maximum RPM. To return to the default settings for a specific fan, click the Auto button. Macs Fan Control can also be set to display in the menu bar, giving you an at-a-glance view of a selected sensor temperature and a selected fan speed. You can also choose to use a black-and-white icon or a color icon for the Macs Fan Control menu bar item. The one feature I would like to see added is the ability to add threshold events that would generate notifications, and change the colors of the menu bar display to gain your attention. Perhaps in a future version, a notification system can be put in place. Macs Fan Control is available for all models of iMacs, MacBooks, Mac minis, and Mac Pros. The app is also available in a Windows version for those of you who use Boot Camp to run a Windows environment on your Mac. If you need an extra level of control over your Mac's cooling abilities, or simply want to see how hot your Mac is getting, Macs Fan Control may be the only app you need. Macs Fan Control is free.